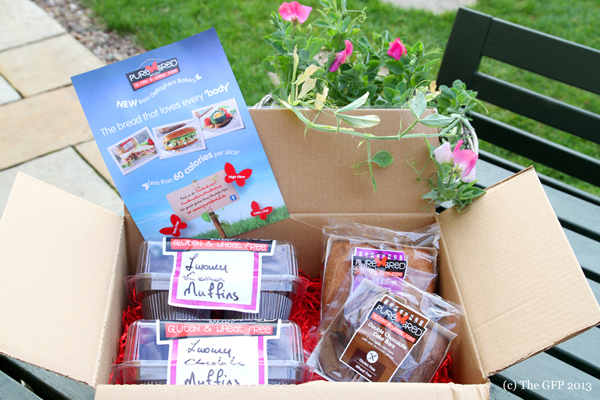 PureBred Gluten Free Bakery http://www.purebred.ie got in touch with me awhile ago and asked if I wanted to review some of their gluten free range. I had high hopes for a great taste factor. Starting with the packaging - there is clear gluten free labelling and they use the cross grain symbol on the front and back of the packaging, which is trusted by the gluten free community. Also, clear labelling of other allergens too, i.e. the mixed berry cake bars are clearly marked dairy free and the back of the packaging has a list of what allergens are in the bake. The lemon muffins had this gorgeous lemon filling in the middle. The texture of something similiar to a lemon curd. The muffin itself wasn't dry or crumbly, but properly 'cakey'. I can say the same for the chocolate muffins. They had an equally great texture and a nice chocolate filling too. Between the two, my favourite was the lemon muffin. The cake bars were surprisingly 'cakey' too. Not crumbly, decent texture and not too filling. The flavours are strong and not overly sweet. PureBred are a family bakery from Co. Donegal. They primarily produce gluten free bread and gluten free bread rolls. You can read a little bit more about their story at this link here http://www.purebred.ie/our-story. PureBred bakery are right up there in the gluten free world in terms of taste. They really know how to create a product that doesn't feel like it's trying too hard to taste 'not gluten free'. It is just a shame that they use such an unhealthy oil in their bakes.